Cheranellore people fume at demand for more land. 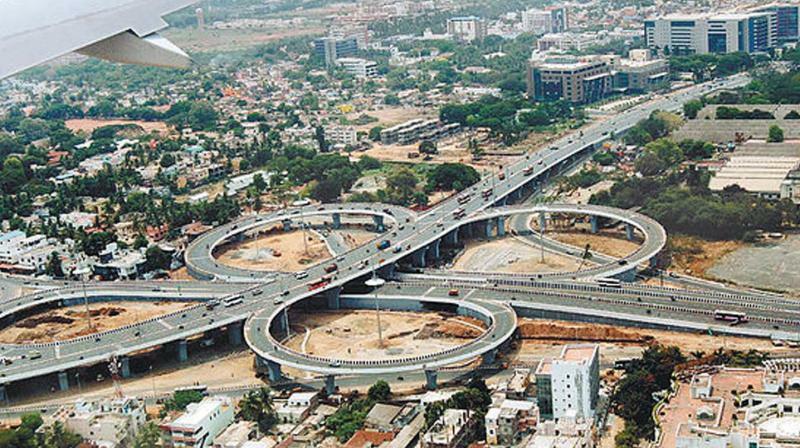 Clover leaf flyover at Kathipara, Guindy Chennai. Kochi: The agitation over NH 66 expansion from Moothakunnam to Edappally has gathered momentum with Cheranellore grama panchayat committee passing a resolution unilaterally again-st building a clover leaf flyover at at Cheranellore junction where the NH66 crosses the Container Road and the Kerala Sasthra Sahitya Parishad (KSSP) backing it. This is taking place amid the claim of the joint agitation forum that the Land Acquisition tahsildar based at Paravur will initiate land acquisition proceedings for the Moothakunnam-Ernakulam stretch from Wednesday. The NHAI is pressing ahead with the clover leaf flyover project at Cheranellore junction. However the agitators point out that this will require extensive land acquisition and additional expenditure whereas normal flyover as done in Edappally junction, Vyttila or Kundannoor is only required at Cheranellore junction. “Instead NHAI can go for the 10 lane elevated highway and according to its own estimate the 23 km stretch from Moothakunnam to Ern-akulam will cost Rs 2300 crore. This is lower than the amount required for acquiring 126 acres for building the NH in 45 metres,” said Hashim Chennampilly, chairman, the joint agitation forum. KSSP Development Cell convener G Gopi-nathan said that NHAI was insisting on building the highway in 45 metres in order to levy toll. “If it is 30 metre highway as demanded by the joint agitation forum, they won’t be able to do so. In fact 30 metres is sufficient enough to build the highway in six lanes. In Kazhakkoottam in Thiruvananthapuram it has already been implemented. Almost three decades back this 30 metres land has been acquired in the Moo-thakunnam-Edappally stretch and hence there are no hassles for it,” said Gopinathan. Cheranellore panchayat president Sony Chi-kku said that a key public health centre of the panchayat will have to be dismantled to build the clover leaf flyover. “At least 450 OP cases are reported daily from here and it will be a severe loss. Moreover, 331 families and 171 shops will have to be relocated to build the flyover,” she said. On Monday evening the resolution passed by the Cheranellore panchayat committee dem-anding to construct the highway in 30 metres and against the clover leaf flyover was read out at the mass convention at Manjummal Junction. As the next step, the agitators will form a ‘firewall’ at Chit-hira Junction at Koo-nammavu on Wednes-day, said Hashim Chen-nampilly.